It’s summertime and my shelf is full of trashy books — the kind that make you feel really guilty. Get your mind in the gutter: I mean literally trashy, like reading about garbage. After recently staging my semi-annual home purge and coming up with a big pile of boxes and bags to donate, I got interested in where all our unwanted stuff goes. Here in Seattle, composting is mandatory, and that’s made an embarrassingly huge difference in how many trash bags go out to the bin, but what about factors like “passive waste,” the invisible garbage generated by the products you purchase as they’re created for you? Or your individual share of your city’s municipal trash collected from public trash cans? Once you start thinking about it, it’s hard to stop. 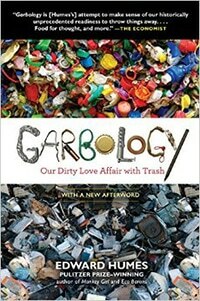 Garbology , Edward Humes – This was the book that kicked off my garbage-reading obsession, and it was entertaining and informative enough to inspire me to keep reading. Pulitzer Prize-winning author Edward Humes investigates the whopping 102 tons of trash that the average American produces over a lifetime: he visits the enormous Garbage Mountain landfill in L.A., talks to the scientist creators of MIT’s Trash Track Project, and explains the myths and truths surrounding the Pacific Garbage Patch. He goes into the history of sanitation engineering, which is more interesting (and gross) than you’d think. There are also some quirky profiles of people with unusual relationships to garbage, like the artists in residence at one San Francisco dump, or the smug hippie family that has managed to get their annual trash output down to the contents of a single mason jar. It’s a fascinating sampler of the garbage-related topics out there, and a quick read. 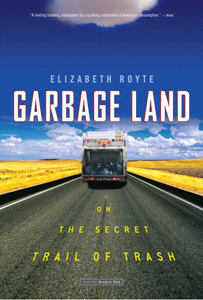 Garbage Land , Elizabeth Royte – Garbage, recycling, yard waste: for most of us, once we dump it in a bin and maybe drag it to the curb, it vanishes from our lives and our minds. But what really happens to the stuff that we don’t want anymore? Royte decides to find out, starting with picking through her own daily trash for a year to analyze the contents. She attempts to follow her garbage to a landfill, her recyclables to a processing facility, even (gulp) her raw sewage to a treatment plant, with mixed results — many waste-management companies don’t want us knowing what happens to our trash any more than we do. But what she does learn will surprise you. Royte’s writing is funny and lively, reminiscent of Mary Roach’s style, and makes a depressing topic (our thoughtless waste) entertaining. Although your little crate of recycled bottles ultimately won’t save the world, Royte says, it’s still worthwhile if it gets you thinking about the effect that your actions and choices have on the environment — especially the decision not to consume. 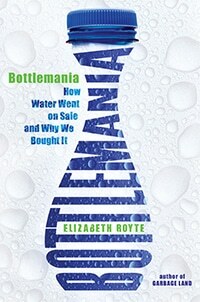 Bottlemania: How Water Went on Sale and Why We Bought It , Elizabeth Royte – Royte’s 2008 follow-up to Garbage Land (above) takes a look at one of my personal pet peeves: disposable water bottles. Clean, safe drinking water for a population of millions is a momentous technological achievement, and a luxury that people in many countries don’t enjoy. Yet somehow we’ve convinced ourselves that tap water isn’t good enough, that specially bottled water in disposable plastic containers is somehow better, even when those single-use bottles end up littering the environment. Royte follows the trail from those glacial mountain springs to bottling plants and your local supermarket, examining the marketing campaign that convinced us all to pay premium prices for something that’s already on tap in every home. 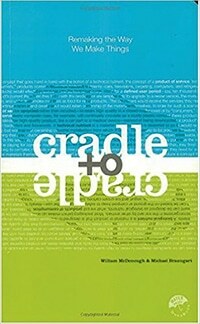 Cradle to Cradle , Michael Braungart — Or, as I keep calling it, “the biodegradable plastic book,” since that’s its most notable feature: the book itself is constructed from synthetic paper that doesn’t use trees (and which also makes it weigh 1.5 lbs). Authors William McDonough and Michael Braungart present their call to action for a new era in industrial manufacturing: rather than generating a huge amount of waste to create plastic goods that are only sort of recyclable, they aim for the lofty goal of Zero Waste, eliminating the concept of waste completely while still allowing for commerce and the manufacture and distribution of durable goods. Their new approach, dubbed “eco-effectiveness,” is illustrated with examples of their own work, corporate overhauls, and technical innovations that could change how we think of traditional environmentalism. On a topic that’s frequently both depressing and paralyzing, it’s refreshing to hear their optimism and excitement, even if the world isn’t yet ready for such radical change (and may never be, sigh). 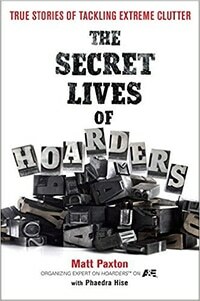 The Secret Lives of Hoarders: True Stories of Tackling Extreme Clutter , Matt Paxton with Phaedra Hise — I have to be honest here and admit that I ultimately stopped watching the popular TV show “Hoarders,” because it felt like the same depressing show over and over again. However, The Secret Lives of Hoarders (written by Matt Paxton, the no-nonsense guy who shows up on “Hoarders” with his stoic cleaning crew when it’s time for the really heavy lifting) is aimed more at the hoarder’s family and friends, who are struggling to get a grip on what this means as they try to help organize cleanups and ongoing mental-health support for their loved one. You’ll learn about what hoarding means (with explanatory pictures), commonly associated mental illnesses, why you should resist the urge to swoop in and do a massive cleanout, and how to provide emotional support for a hoarder and help them get the mental-health resources they need. A matter-of-fact, non-shaming introduction to hoarding from someone who’s had all too much experience with it. 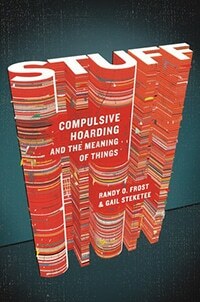 Stuff: Compulsive Hoarding and the Meaning of Things , Randy Frost and Gail Steketee — Here’s another hoarding book, this one intended more for readers who are interested in a general exploration of the subject (rather than a personal involvement). Dr. Randy Frost, a professor of psychology at Smith College, and Gail Steketee, dean of the social work school at Brown, have drawn on their years of work and interviews with hoarders to create this layman-friendly introduction to the world of compulsive hoarding. They begin with the story of the “Collyer Brothers,” a pair of New York brothers who famously perished in their own trash-packed mansion after decades of compulsive collecting. Focusing mainly on interviews with real hoarders, the book explains what hoarding behavior is and looks like, and what’s going on in the neuropathology of hoarders that makes them act this way: hoarders are often sensitive, creative, intelligent perfectionists who hoard out of a fear of wastefulness, personal trauma, or because of emotionally associated memories. You’ll learn why hoarders seem blind to their unhealthy conditions (they are), and how their own cleaning efforts get derailed. Sensitively handled and informative, this understanding guide to hoarding goes deeper than the exploitative TV shows. 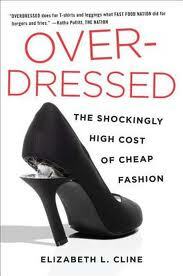 Overdressed: The Shockingly High Cost of Cheap Fashion , Elizabeth L. Cline — I got my copy from the library (more environmentally friendly than buying my own), which made me feel a bit better about my overstuffed closet. Author Elizabeth Cline, like many of us, used to buy cheap, new items of clothing from discount chains almost every week. Then she started wondering about the environmental, social, and economic effects of this unchecked bargain-basement consumption. She explores the rise of the massive international budget-clothing chains, visiting sweatshops and factories in Asia, and how they’ve harmed independent designers who struggle to sell higher-quality clothes at a fair cost. Most intriguingly for me, she also follows the trail of our well-meaning (but overwhelming and largely unhelpful) clothing donations to thrift stores. But it’s not all depressing: Cline offers solutions on how we can break the cycle with our own fashion choices, rewarding quality and innovation with our consumer dollars, and choosing to keep and repair items for a longer useful life. That’s fashion you can feel good about. Read the full review. Junkyard Planet , Adam Minter – Little did I know when I started reading this book, but it turns out that China is the center of the recycling universe. 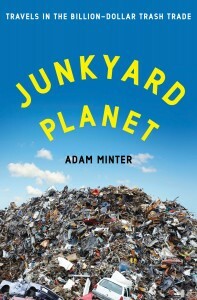 Adam Minter – a Shanghai-based journalist who was raised in a family of junkyard owners in the outskirts of Minneapolis – calls on his many connections in the industry to produce Junkyard Planet, a humorous but sobering look at the international recycling business. He reveals how more than half of Americans’ recyclables – copper, cardboard, plastic, computer chips, even Christmas tree lights – end up on the other side of the Pacific before they’re transformed back into new raw materials for the burgeoning Chinese economy. Following the convoluted route these products take on their recycling journey, he makes quite an entertaining adventure of the project, successfully arguing that no matter how green and benevolent our intentions, the recycling business is going to follow the money – and lax environmental laws – just like any other business. Read the full review.